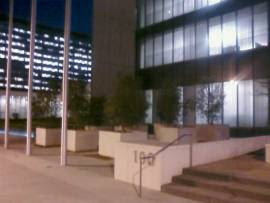 SoapBoxLA: LA.Streetsblog - Where’s the Bike Parking at the New LAPD HQ? 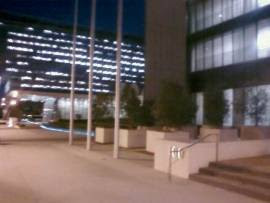 LA.Streetsblog - Where’s the Bike Parking at the New LAPD HQ? 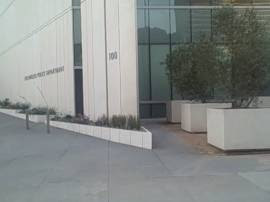 The largest and most expensive police building in the United States is about to be dedicated and as the world watches, the LAPD's ignorance of basic Crime Prevention Through Environmental Design (CPTED) standards will be revealed. The new headquarters are located across the street from LA's City Hall and the 10-story, 500,000-square-foot building has a beautiful open plaza featuring drought resistant plants and a zen garden theme that creates a sense of calm in the middle of the busy and congested city center. It also features a bike parking area that violates basic CPTED standards as well as simple bike parking standards. CPTED is the simple philosophy that crime can be prevented by designing an environment so that criminal behavior is not supported by hiding places, blocked vision and isolation. 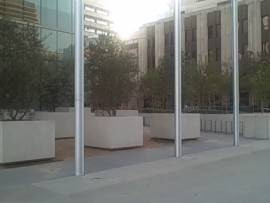 The LAPD headquarters have installed bike racks that are as far from the front door as possible, to the left and out of sight, around the corner and blocked by nine large planters and surrounded by a wall that would hide a bike thief who was working on the bikes. Topping off the poor design is the existence of a 8' by 8' setback in the wall, creating an ideal hiding place. As for the racks themselves, they are positioned so tightly that anybody parking a bike there has a ready alibi for handling other bikes because they simply don't fit, falling far short of the basic standards established by the Association of Pedestrian and Bicycling Professionals. The ultimate irony in this is that the LADOT is also across the street and they, along with City Planning, are in the process of developing the Draft Bike Plan for 2009 which would replace the 2002 Bike Plan. Both Bike Plans have bike parking standards and even go so far as to give the LADOT responsibility for communicating these standards to other city departments. A simple visit to a park, to a library, to a fire station, to a regional City Hall, to Parker Center is enough to demonstrate that there is no citywide standard for something as simple as bike parking, all while the City has a person in charge of Bike Parking. One might forgive some of the old wheel bender "toast" racks or the useless "wave" racks or the simple inverted U racks that get installed incorrectly, rendering them useless and serving only to remind cyclists that they simply don't belong. But as the City of Los Angeles prepares to hit the spotlight and to dedicate the most enormous and expensive monument to modern crime prevention, it seems sad that they forgot to consider CPTED. The area just to the west of the plaza is the wrong location for the bike racks. They belong no more than 50' from the main entrance, they must be visible to those in the lobby, to those passing by and to the guests who visit the LAPD headquarters. They must be safe, convenient and secure. It's not just about bikes any more, it's about the LAPD's reputtion.